Driving Lessons in Bangor, Newtownards, Holywood, East Belfast, Dundonald, Comber, Greyabbey, Ballywalter, Millisle, Donaghadee and Groomsport. XLR8 Driving NI is run by Colin Lyons, a driving tuition professional based in Bangor, North Down, Northern Ireland. At XLR8 Driving NI I understand that everyone has different needs and abilities when learning to drive. 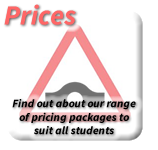 I will provide you with a properly structured course of driving lessons to maximise your learning potential, helping you to learn to drive safely and with confidence. I pride myself on my excellent first time pass rate and I encourage you to see what customers say on my testimonials page. At the moment I have some excellent starter packages if you buy your lessons in bulk (see my prices page for more information). I train drivers throughout Bangor, Newtownards, Holywood, East Belfast, Dundonald, Comber, Greyabbey, Ballywalter, Millisle, Donaghadee and Groomsport.